1. 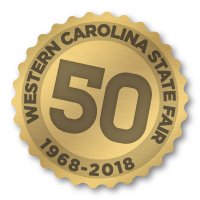 The Western Carolina State Fair Goat Show is open to all South Carolina and Georgia youth ages 5 to 18 years old. 2. Only South Carolina 4-H and FFA Meat Goat Project participants are allowed to participate in the market classes. 3. Doe classes are open to all youth. 4. Each exhibitor is required to pay an entry fee of $5.00 per animal. Make checks payable to Western Carolina State Fair. 5. Each exhibitor will receive one gate admission ticket for themselves, and one extra. Additional tickets may be purchased in advance on the entry form for $6 or on the day of the show for $8. 6. All goats must be on the grounds by 5:00 p.m. on the day of the show. Judging begins at 6:00 p.m.
7. Exhibitors are to enter through the main gate to check in. 8. Knives are not allowed on the fairgrounds. This includes those used for hooves. Metal detectors are in use. 9. After check-in, exhibitors are to unload their animals and supplies. No trucks are allowed inside the gate. Equipment must be carried in from the designated parking area. 10. The youth must always maintain control their animal(s). 11. The show coordinators reserve the right to make decisions concerning or changing rules, regulations, and/or health requirements. Any animal exhibiting any significant symptoms of disease or sickness will not be unloaded from the vehicle and is not allowed to remain on the fair grounds. 12. Exhibitors must furnish feed and water for their animal. There is no washing area at this show. 13. The market classes and doe classes are broken into 3 to 5 weight classes depending on the number of entries. These are determined by the animal’s weight on the day of the show. 14. Does born between September 1, 2017 – June 21, 2018 are eligible for entry. 15. Market goats and does may be entered in the Showmanship Class. 16. Awards are determined by the Western Carolina State Fair at the show and are based on the number of entries.